Lip-product used: IsaDora’s Perfect Moisture lipstick in Chelsea Red. Just some villainspiration~ I think I’ll upload these when I’m in the mood! I’ve decided that this will be my last Glossybox for a couple of months since I’ve to save for the trip to London this summer. I won’t get student grant during the summer either so… I’ll be broooke! ;w; I really need to cut back on unnecessary things too, haha. Anyway, April’s box is called Spring clean your beauty and I’m really happy with what I got, especially the two full-sized products! This hair mask smells A-M-A-Z-I-N-G. I can’t even describe how good it is! >w< I haven’t tried it yet but if it’s like every other product I’ve tried from Maria Nila… it’ll be awesome! This product is full-size and costs 199 SEK/250 ml. My mother will get this one, haha! This is not a full-size product but 250 ml costs 299 SEK. Färg = color in Swedish. I remember seeing these palettes in another box but I didn’t get it. I was happy then because the girl that showed her unboxing got some pretty boring colors. I was lucky enough to get colors I use often! These can be applied dry or wet (I love when you can do that). This is a full-size product and they cost 249 SEK. This product sounds like an eight wonder or something! “Makes pimples disappear in 24 hours”… I really hope that it keeps what it promises! This is not a full-size product, in fact, it’s tiny… but the full-size one costs 159 SEK/15 ml. I thought this was a The Body Shop product first (but it clearly says balance Me on the bottle)! I’m not really a fan of getting body washes in the box but it was a long time since I got one so it’s fine! This is not full-size and 260 ml cost 105 SEK. Even though I said this will be the last Glossybox in a while… it’s not actually true. I’m going to unbox the “Mother’s day”-box too! So look forward to that~ It will definitely be the last one in a while though! Makeup of yesterday: It’s all about the wings! … winged eyeliner, that is! Thick wings are so nice when you are too lazy or sick to wear much makeup! Mixed my lenses yesterday. Because the other red lens had dried up… it’s fine now after it’s been in solution for a few hours! I liked the subtle hint of different colored eyes. 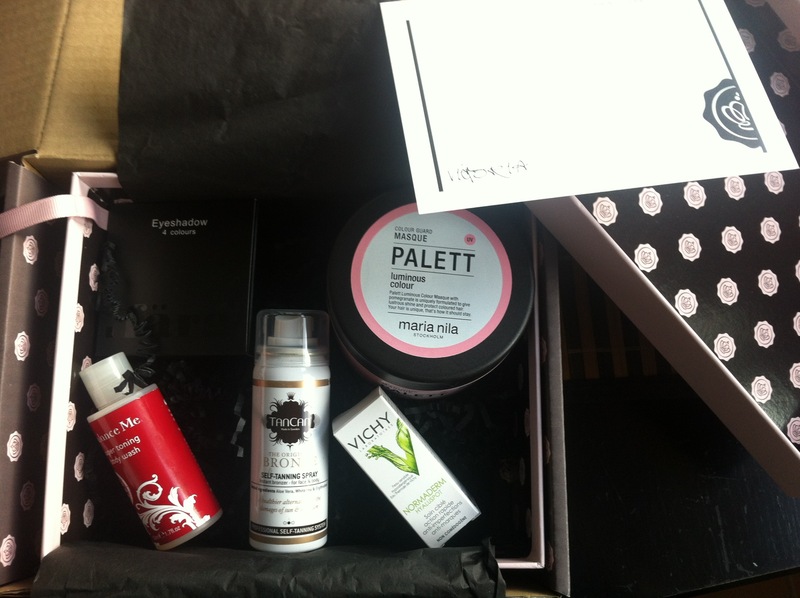 Swedish Glossybox March 2013 – The Red Carpet Box. Hi ladies (and maybe some guys)! The March box is a little late but it’s fine… it’s fine. Easter messed everything up I guess. Anyway! As you can tell from the title, this box is dedicated to the red carpet look a.k.a. beauty in the moment. They’ve focused on mouth, lips and skin. I’ve never used anything like this so I’m curious to try it! ^_^ There’s three strips in the card. The original product contains 15 strips for 499 SEK. When I saw ColourIt‘s Glossybox, I really hoped that I would get this products because I love products you can wet to get a more intense color (like the So Susan-palette in the December Glossybox)! This is the original product and it costs 169 SEK. This is a product I’m looking forward to try! ^_^ It seems perfect for teenage skin (so I’m also going to make my brother try it) and 2-in-1 products are perfect for someone like me, that breaks habits all the time. This is the original product (200 ml) and it’s worth 85 SEK. I really like The Body Shop as a company (their way of thinking is awesome)! The creams doesn’t smell amazing but I’m sure they’ll do their job. They are not original product (only 15 ml compared to the original product’s 50 ml) but the day cream costs 129 SEK and the night cream costs 175 SEK in the store. Jelly Pong Pong has the two bunnies-logo on their products, which means that they are cruelty free *wooh*! This is the original product and it’s worth 129 SEK. I’m very satisfied with the March box, like everybody else it seems. I’ve seen many state that this is their best box so far. I can’t really decide though! I’ve liked almost all of them (and those I haven’t liked that much has had at least one amazing product). I swapped with Samantha and we both sent our packages exactly two week ago~ She received hers on the 28th and I received mine on my birthday (30th). I was jumping around like crazy when I saw that the package was in the mailbox! I almost didn’t pick up the post that day, but 30th was my lucky day so I did in the end! Four lavender tissue papers wrapping seven products~ Picture taken on the 30th. I was really exited and ran back and forth to my mom to show her what I got! The preferences I told Samantha was that I wanted products that I won’t find in Sweden + that I like bright colors. When I realized how much she’d gotten me… I was sad that I couldn’t get her more (make-up is so expensive here :c). We’ve said that we’ll do this again, so when we do it I’ll pick the things I couldn’t buy her this time! 2/3/4. Glam crystals, Extreme 24 hour felt tip liner and intense colour eyeliners. 1. Collection, Glam crystals, dazzling gel liner in Shake it up! 2. Collection 2000, Extreme 24 hour felt tip liner in Teal. 3. MUA, Intense colour eyeliner in Turquoise. I’ve used every one of these and I have to say, they are amazing! I’m always a fan of glitter and the Glam Crystals is pretty and stay on all day~ The Extreme felt tip liner baffled me, it suuuper opaque and glued on once applied. I’m in love with it… fo’ reals! Also, I used the turquoise one today, even though it’s very summery I made it work (and I will definitely use it more in summer). The sharpener is also very good (compared to similar ones I’ve used, this has been the god of all eyeliner sharpeners)! 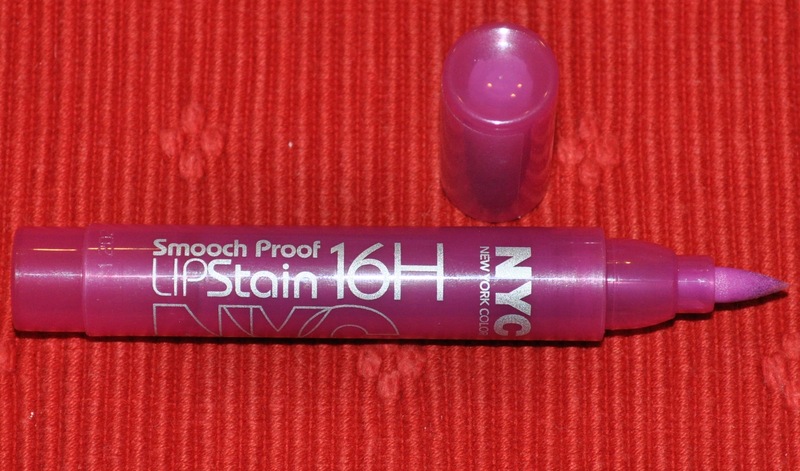 New York Color’s Smooch Proof LipStain 16H in 491 Forever Freesia. I. Love. This. One! Lipstains are awesome and this one is the best one yet! It stays on, makes my lips just the right color and just- it’s great. This is a Makeup Academy lipstick in Nectar. It’s as bright orange as the blush above and I don’t own an orange lipstick so it was a good choice in color~ I’m going to use this one a lot when the sun comes out! That was everything! Thank you Samantha for the products (that exceeded the pricelimit of £10/€12/$16! Next time is my turn~ When’s your birthday? :D) and of course to Naomi at Bewitchery, none of this would’ve been possible without her organizing the Budget Beauty Blogger Swap! To see what I got Samantha, click on this link: The Budget Beauty Blogger Swap! – Part 2. The anticipated, first Glossybox of 2013 is here! It feels like forever since the last one because we received it before Christmas. The theme of this month is “Functional beauty”. A physical copy of Glossymag was on top of the box when I opened it. Even though I don’t really like trends… the ones featured in the magazine are right up my ally! E.g. “Powerlips”, “Glitter and Glam” and “Lashes de luxe”. The rest I don’t really like… at all (on myself) so ponytails and ballerina buns, I’ll leave to the rest of the beautiful people. So let’s start with what I got in my box! 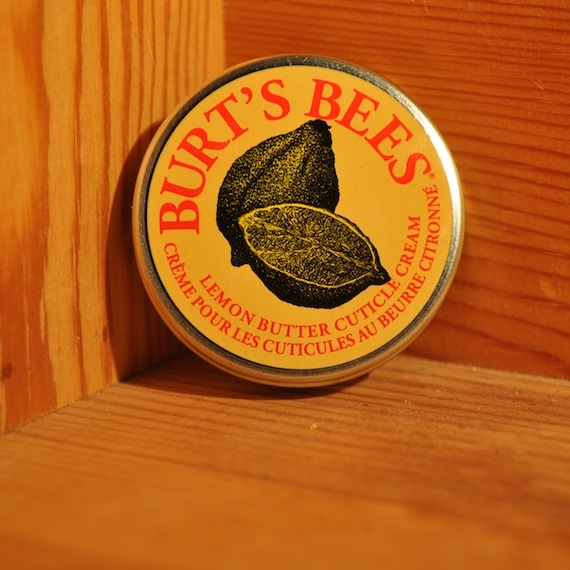 100% natural cuticle cream from Bert’s Bees in a tiny tin. Smells wonderfully of lemon and has the same color as lemon curd. The product strenghten and moisturises your nails and cuticles. The product is 8.5 g/0.3 oz. which is half the original product on 17 g. for 79 SEK. I have not owned a cuticle cream before so I’m exited to try it since my cuticles during winter always get sore and crack. The smell is also very pleasant so I’m looking forward to using this before going to bed! I’m a fan of dry shampoo so I will probably like this product! The packaging is really cute and the matt, cream color make me think a little vintage and luxury. A interview with the duo, Adam Reed and Paul Percival can be found in Glossymag where the interviewer says that they, as innovative as they are, came up with dry conditioner! This little 50 ml can is the full-sized product and is worth 129 SEK. “This intensely colour-rich, matt and crease-resistant formula has been designed for use on the face, eyes, lips and body. Apply with an Illamasqua brush or simply use your fingers for a buildable, water-resistant, highly pigmented finish.” -from Illamasqua’s site. 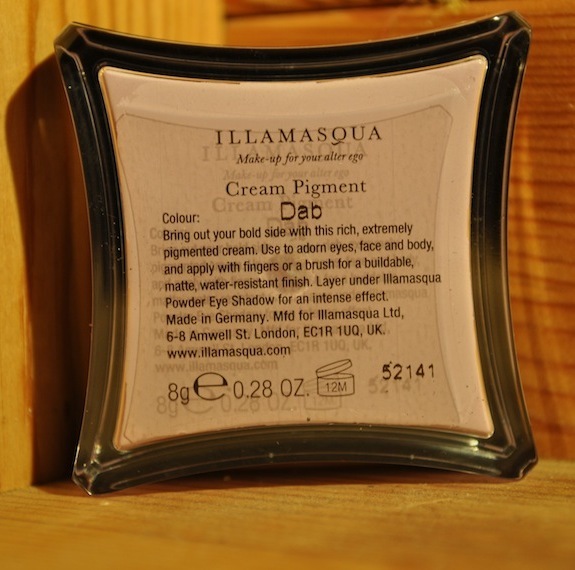 I was so exited when I saw an Illamasqua-product! I’ve been wanting to buy something in forever and their sale that ended today might’ve been a golden opportunity but I have to prioritize other things unfortunately. I got the lilac color Dab. It’s a bit pale for me but since the formula is discribes as absolutely amazing (water-resistant, matt, buildable, crease-resistant ect. 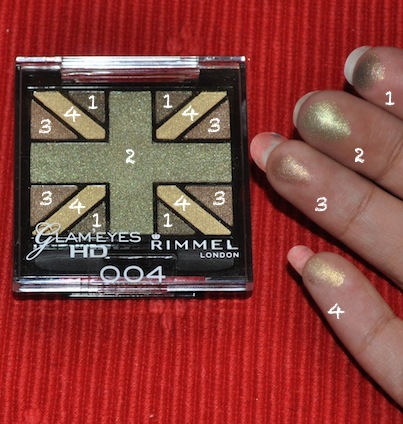 ), I’m going to use it as a base under the eyeshadow I want to wear! This is of course the full-sized product and costs 179 SEK. A waterproofed and extremely lasting eyeliner. It’s creamy and soft which makes it easy to apply. Contain shea butter and vitamin E.
I’m really happy that I got this product because my eyeliner has been running on empty for quite a while now! It’s jet black but has beautiful glitter in it so I’ll have to buy a new one anyway ( I need a plain black one when I’m doing my project). This black with sparkles is called Secret Grey 02. It’s full sized and costs 109 sek. Gentle and effective makeup remover wipes containing organic olive oil and olive leaf-extract which will soften and moisturise. Only used makeup remover wipes one time but I think that the consept is great since its organic and I feel like wipes are less messy than using cleansing lotion and cotton buds. The wipes smell pretty pleasant… I’m not a fan of the way olive oil smells so that should tell you something! This is an original product and is worth 50 SEK. I’m very satisfied with the products that I got since I’ve gotten a lot of things I haven’t tried and things I need! I’m very annoyed with the people complaining on the Glossybox.se-facebook page. They say that they’ve gotten a box of low quality products and not what the Glossybox-site promises! 1. You received a box with 5 beauty products (just as they promise). Even if you get toothpaste, that is a beauty product (if it whitens your teeth). Since I read that someone got it and was disappointed and I don’t know any details but I would asume that it whitens your teeth. 2. They tell you that you will receive samples to discover new products. Now if you’ve read through all the products I got, 4 out of 5 are full-sized. I don’t know about you but I’m very grateful. 3. If you notice that you aren’t satisfied, send them an email or something! No one (except your fellow complainers) is going to want to hear that you are suuuper disappointed and that Glossybox should shape up since you wanted that product and not the one you got! They use your beauty profile to decide what box you’ll get so do something about your profile! You can always switch with someone else on the page (seen it happen) if anything else. Phew. Now that’s out of my system (almost). Hope you enjoyed the post! See you tomorrow~ I have to sleep now.